Given any argument, does the truth table necessarily contain more rows than the number of open branches in the completed tree? My gut feeling tells me no because I could always find a complex argument in which the tree for that argument would have many branches. Is that right? The truth table TbA for A will have 2n rows. The truth tree TtA for A has an unbounded number of open branches. Therefore, the TbA does not necessarily contain more rows than the number of open branches in TtA. 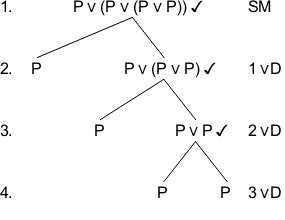 We already provided several counterexamples to the claim that a truth table necessarily contains more rows than the number of open branches in the completed tree, but we can generalize this phenomenon (at least in the disjunctive case) by noticing that the truth tree always branches at a disjunction. If there is no contradiction on one of the branches, the branch will remain open. 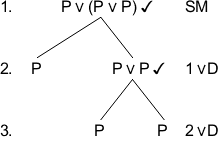 Where P is a sentence letter.The three above cases in fact show this disjunction where n = 1, 2, 3 respectively. Truth trees generated with http://gablem.com/truth-tree-solver/sentential-logic.